✅2 x PAIRs – Choose Medium or Large from the from down menu above. ✅Ergonomic 4-way stretch glove with controlled compression “massages” away pain and reflects heat. ✅Increase circulation to aching hands, fingers and wrists. ✅Soothe Hurting Hands In HEALING HEAT. Machine washable. 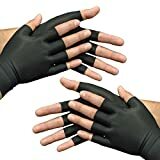 Anti-Arthritis Health Gloves (2 x PAIRS) – Choose Medium or Large from the from down menu above. – Treat your hurting hands to healing therapeutic warmth and ease pain from arthritis or carpal tunnel syndrome. – The ergonomic 4-way stretch gloves with controlled compression “massages” away pain and reflects heat, increasing circulation to aching hands, fingers and wrists. – Breathable Nylon/Lycra Spandex blend. – Please choose Medium or Large using the hand size chart above. – Colour exactly as show in the image above. – You will receive TWO pairs in each pack ordered. This entry was posted in Health Products and tagged AntiArthritis, Black, Choose, from, Gloves, Health, Large, Medipaq®, MEDIUM, Pairs, THERAPY by Healthy Senior Lifestyle. Bookmark the permalink.